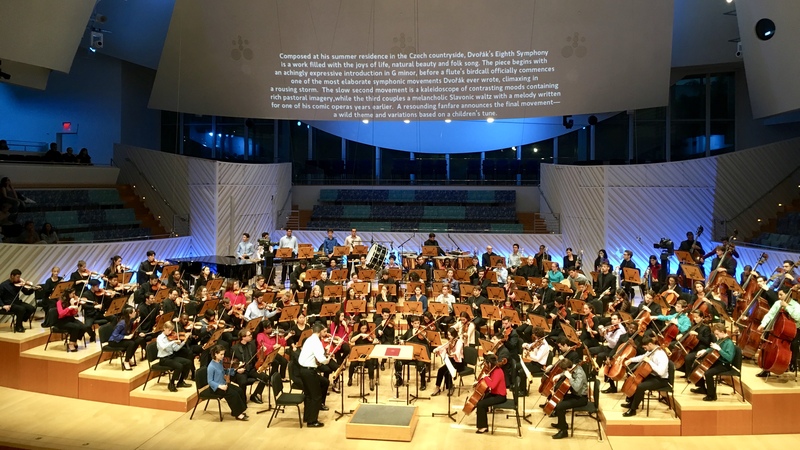 One of the more striking design aspects of the New World Center, the performance and educational facility in Miami Beach, FL, is the capacity for its resident New World Symphony to beam concerts to the surrounding community via its 7,000-square-foot projection wall. Though the hall has been open since January 2011, the outdoor Wallcast series, as it’s called, has been getting small but steady upgrades. 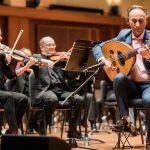 I got a taste of it at an April 28 New World Symphony concert, which featured Dvorak’s Eighth Symphony, Tchaikovsky’s Violin Concerto, and Ginastera’s Four Dances from Estancia, all conducted by orchestra cofounder Michael Tilson Thomas. I’ll be writing a more detailed report for an upcoming issue of BBC Music Magazine but, for now, a few impressions. 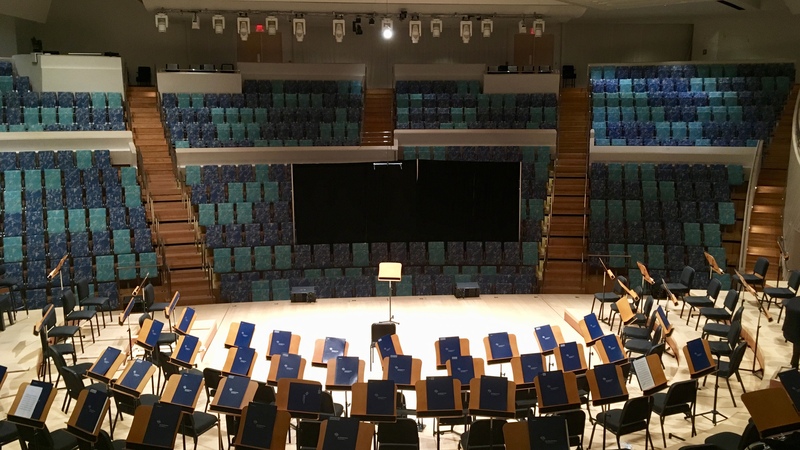 I heard the first half of the concert inside the 756-seat auditorium, which was designed in an arena style by Frank Gehry. 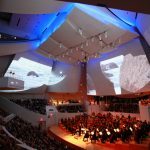 As president and CEO Howard Herring explained over lunch a day earlier, orchestra officials asked Gehry to design the auditorium with a steep rake, so that players and audience members were literally face to face with one another, rather than being at a distant, chilly remove. Blonde wood and brightly patterned seats abound. Rear windows admit light but seem to block out street noise. The stage floor is made of Alaskan Cedar, a material that reflects light onto the players’ faces. 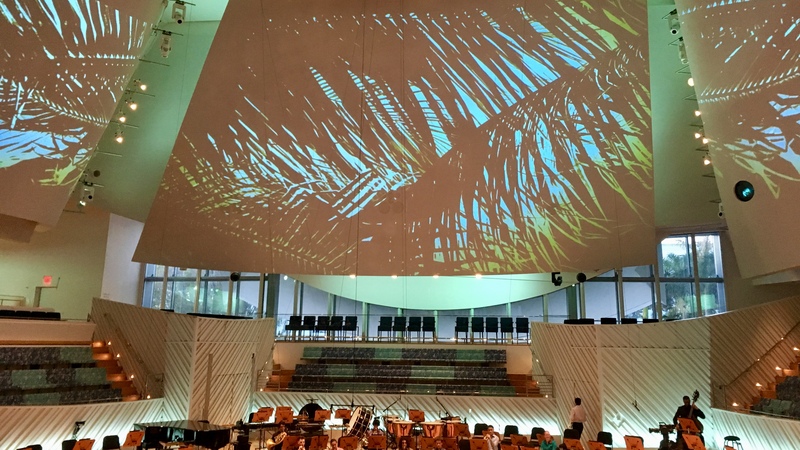 The curvilinear acoustic “sails” that span the upper half of the room featured projections of Florida-appropriate images; between pieces, the palm leaves subtly changed colors, as did the backlighting (the sails are also used for more sophisticated multimedia productions). 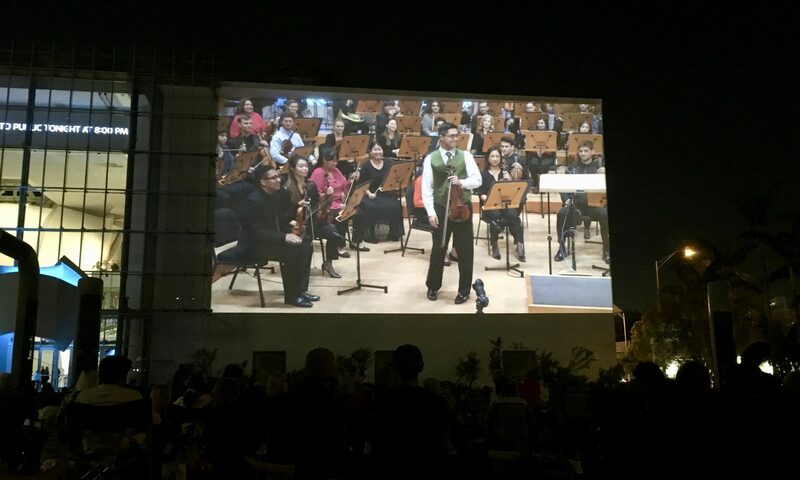 Pre-concert projections before the New World Symphony concert. 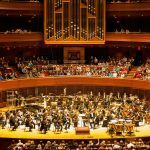 As in a furniture store or auto showroom, lighting design is given considerable focus in the hall; Tilson Thomas may ask the production team to highlight different musicians during a piece through subtle changes of colored lights. Succinct yet informative program notes were projected onto three main sails before each piece. 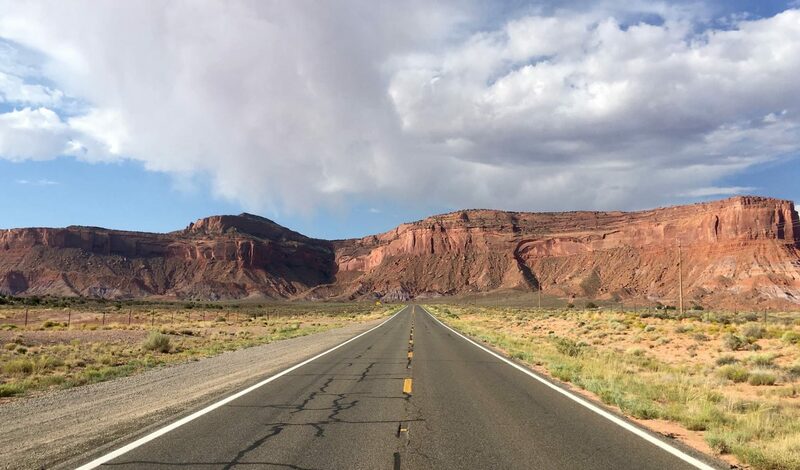 If the acoustic in the room seemed a bit bright, that was no accident: acoustician Yasuhisa Toyota started from the perspective that it would be easier to tone down a bright room than try and liven up a dead acoustic. Along certain interior walls, strategic fabric padding had been added for this very purpose. 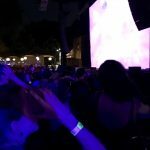 Heading outdoors at intermission, by my rough estimate, there were well over 1,000 people watching Saturday night’s concert in the 2.5 acre Soundscape Park, which is lined with two overhead “bars” of loudspeakers. It delivered a “surround-sound” experience in the best sense of the word. The half began with the impressive young violinist Matthew Hakkarinen performing the first movement of the Tchaikovsky Violin Concerto. Patrons sat on blankets and lawn chairs, eating picnics and finishing off bottles of wine. The crowd was remarkably attentive during the performances. Although a few fled before the Ginastera, the atmosphere was nonetheless a departure from the loud chatter endemic to many a Central Park concert. 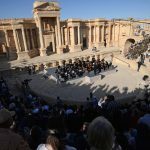 A seven-person team of video producers and engineers mapped out a Wallcast production that included more than 700 shots over the course of the evening, up from 400 shots at a typical Wallcast circa 2011. They included some eye-catching angles. 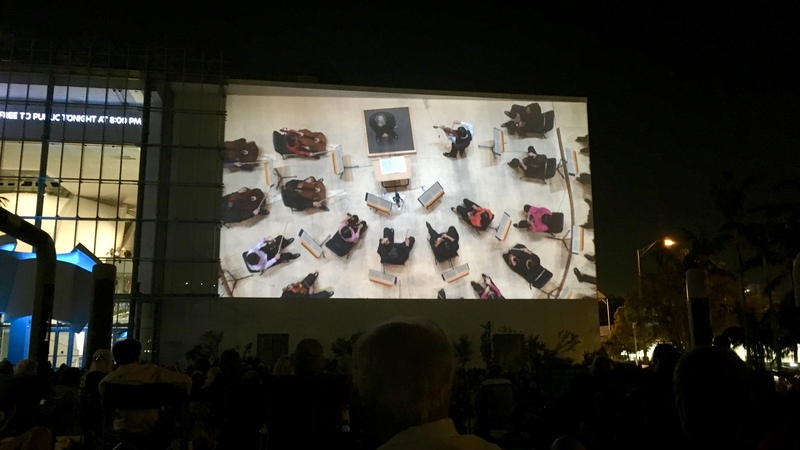 An overhead shot as seen on the Wallcast of a New World Symphony concert. 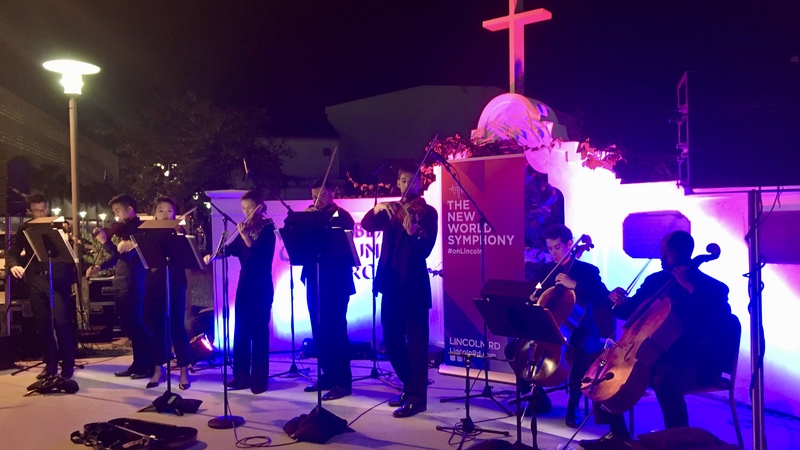 After the concert, a group of fellows from the orchestra raced over to Lincoln Road, a pedestrian strip of outdoor restaurants, hawkers and chain stores. Set up near a church with modest amplification and NWS branding, their concert drew several dozen spectators. 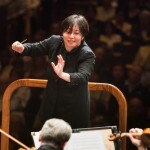 The players even invited one audience member to “conduct” the ensemble in a Mozart serenade. 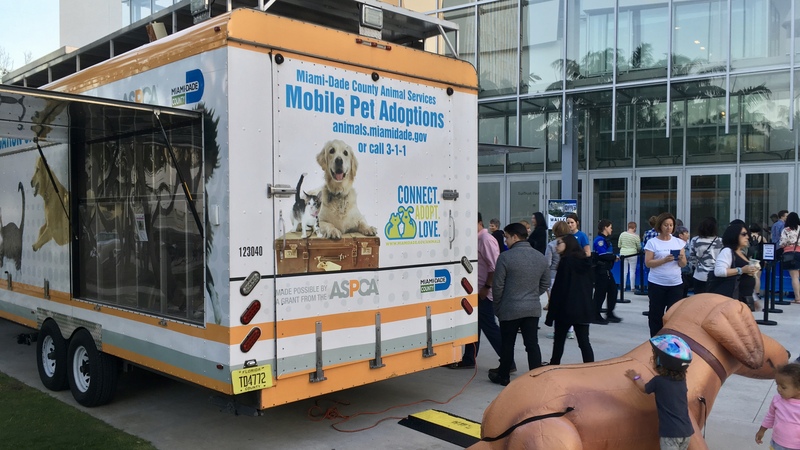 Before the concert began, there was another event in Soundscape Park: a pet adoption truck, which was linked to one of the Symphony’s various outreach partnerships. Earlier this year, a group of New World fellows performed at the shelter in an effort to calm the stressed-out pets who were up for adoption. A pet adoption drive outside the New World Symphony concert in Miami, FL.